"There are many angels, maybe as many as the stars in the sky . . . ."
And every single one of these precious beings offers the world unique blessings. 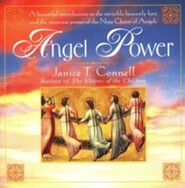 ANGEL POWER describes the special tasks and responsibilities of each of the Nine Choirs of Angels. The Seraphim, Cherubim, and Thrones are angels of goodness, love, and wisdom. The Angels of Dominion are angels of leadership. From the Virtue Angels flow miracles of healing, comfort, and peace. 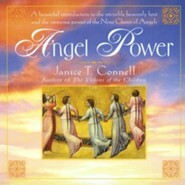 The Power Angels are special warriors against evil and defenders of goodness. The Principalities, Archangels, and Angels administer our planet. By illuminating each Choir's special powers, the author enables us more easily to draw upon its particular, radiant light. Weaving her own personal angel experiences together with angel prayers and with true angel stories she has been told, the author teaches us to open ourselves to angelic guidance, support, and protection. Her book spreads before us a dazzling and profoundly reassuring prospect of angel power at work -- a vision so beautiful and potent that those who experience it feel they know heaven on earth. Janice T. Connell acts as a consultant to clearinghouses for Marian information throughout the world. She is the host of a nationally syndicated radio program called The Power of Love and the founder of the Pittsburgh Center for Peace (a Marian organization) and the international Queen of Peace newsletter. Connell is also a practicing attorney in ethics and international law. She lives in Florida. I'm the author/artist and I want to review Angel Power - eBook.